Statement necklaces and colorful gowns at the 91st Academy Awards held Sunday night topped off a sartorially dramatic 2019 awards season. Last year, Hollywood restrained itself on the red carpet in a show of solidarity for the Time’s Up movement. This year, the mood was different, as if bedecking oneself in joyful fashion expressions was an assertion of each actress’ personal power.And what a treat that was for viewers, as resplendent as each woman (and several dapper men) was in risk-taking gowns and bold jewelry not for wallflowers.The boldest of them all was, naturally, Lady Gaga, who saved her best Tiffany & Co. look for last. The 128.54-carat cushion-cut stone is said to be one of the largest yellow diamonds on record. It was discovered in 1877 in South Africa as a 287.42-carat rough, and acquired by Tiffany & Co. in 1878. 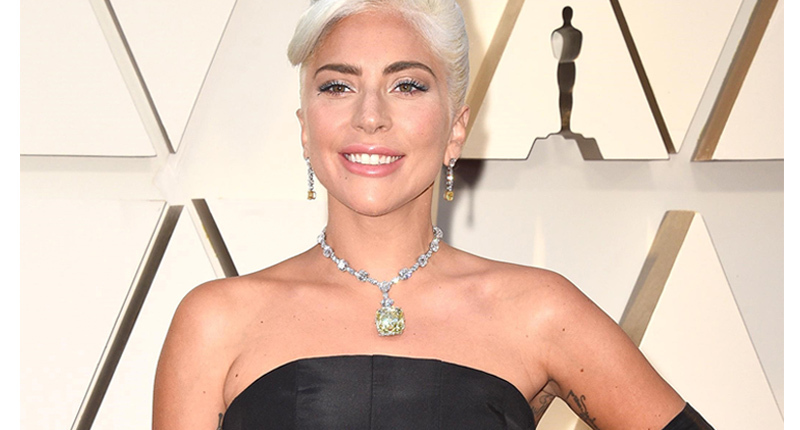 The stone was set into the style Gaga sported, a platinum necklace with more than 95 carats of cushion-cut and round brilliant white diamonds, in 2012 to mark Tiffany’s 175th anniversary. The pop star paired the stunner with yellow and white diamond drop earrings from the 2019 “Extraordinary Tiffany” collection, and a black Alexander McQueen dress and gloves that felt like an ode to Hepburn’s iconic Holly Golightly character.